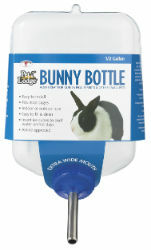 This large-capacity plastic water bottle works great for rabbits, hamsters, gerbils, guinea pigs, chinchillas, and ferrets. The extra-wide mouth accommodates ice cubes for cooling the water in hot weather. Easily attaches without tools to most wire hutches. Can be used indoors and outdoors and is airline approved.